Step 1 Work out the number of weeks until the first examination. Use your examination timetable and a calendar. 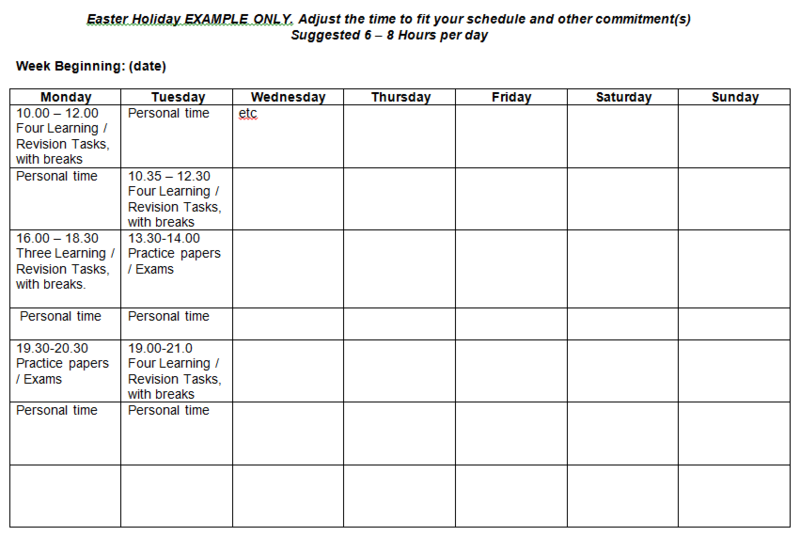 Step 2 Create a page template (as below) for each week until the examination. Doing the electronically allows you to make adjustments as you approach the exams. Place the date for the start of each week on the pages, so you know the order and can track the weeks. Step 3 Include a separate page template for the holidays (see below). When mapping the holidays, be realistic about the time you can work for. Over the holidays A little time off is important, but you still need to be strict. Step 4 Work out your strengths and weaknesses: across your subjects and within each subject topic. Prioritise what you need to LEARN. Make a list of these LEARNING PRIORITIES, in numbered order. Print this out and stick it up on a wall, or similar. Step 1 Start from your first exam and work backwards, to include final REVISION and EXAMINATION PRACTICE in your grid. Step 2 Include coursework deadlines, to make sure you have allowed time to complete the coursework – although most of this can be done by committing extra time in school. Step 3 Start at the present time, and fill in LEARNING tasks as numbers, from your list of LEARNING PRIORITIES, to address your weaker priorities. 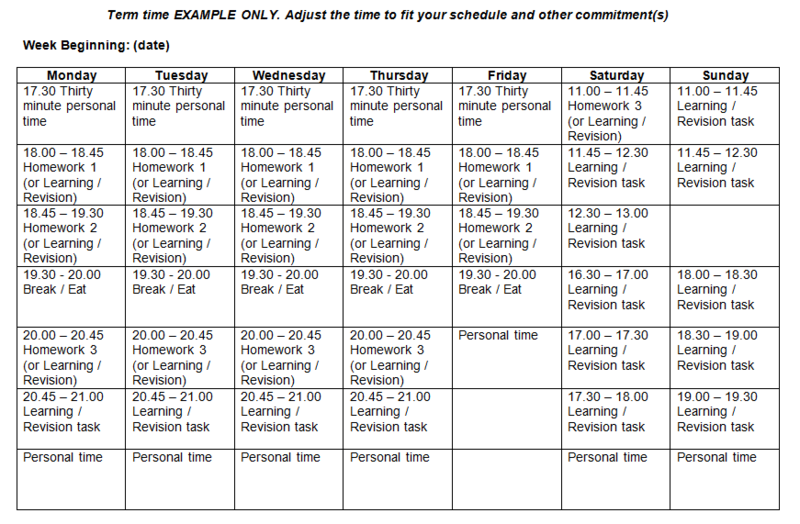 Once this is complete, start to fill in your revision schedules with these numbered LEARNING PRIORITIES. Step 4 By Easter at the latest, you need to start REVISING. Start to include some revision in your timetable, if you have not complete the LEARING PRIORITIES list. Also include examination practice. Step 5 Using the Grid: Bring forward the LEARNING PRIORITIES tasks when you are not set other homework. Don’t take it as free time. Create a structured subject-specific location for all your on-line learning resources. Use a variety of ways to LEARN: Mindmaps, revision sites, flash cards, explaining it to other people. Simply – find different ways to keep using the information. Cross off each item on the LEARNING PRIORITIES list as you complete them. This will help your see your progress. Keep going – even if you have interruptions to your programme. Just make an adjustment and keep going. Don´t cut yourself off. Use friends, family, teachers, tutors and classmates. Don’t cram the night before an exam by staying up late – you will be stressed, less able to process questions and answers and less able to remember information. Finish early enough each evening to give yourself some personal time. Knowing information is about building links in the brain into the memory. Revision is just looking quickly over some information to help remember things which have already been learned. This makes the memory links stronger again. Learning, rather than revising, takes more effort – this is building memory links which don´t yet exist. Many students say they plan to revise for exams, but they need to be prepared with the time and commitment to LEARN what they don´t know. Works better if you UNDERSTAND what you are learning. Works better if you keep going back to the information – so you make the links stronger. Works better if you link it to things to already know. Be honest – does something need learning or revising? Learning something will require more time and commitment. Use resources to find out what you need to learn. For Year 7 to Year 9, this will be topic list information for your teachers. For Year 10 upwards, use the subject specification (syllabus) from the exam board website. Keep copies of this – highlight them, add to them, colour sections – whatever works for it to help you. Make sure you know where your GCSE subject website is – how to get the specification, and past exam papers. Save it in favourites. Use the examiner´s reports to find out what students usually get wrong. 3. WORKING SMARTER – MORE OUTPUT FOR LESS INPUT! If you understand everything then this counts as having revised – this is your revision done for a section. Focus on the points which are explained and you feel you don´t know or don´t understand. These are the parts you now must learn! Use several videos for a topic area, to make sure you have covered it all. Practice explaining what you are learning or revising to other people – or try writing it. Remember to be clear, thorough and detailed. Even if you know stuff in your head, it doesn´t count unless you can put it into words. Remember – learning means learning the words as well as the ideas and understanding. Don´t stop or get fed up – THINK! Every new thing you learn could be an extra mark in the exams. We believe that in the right environment with the right attitude all students are capable of achieving and succeeding. We share that responsibility with all students and their families. In order to support students in developing as responsible, independent and effective learners we have now introduced the concept of Responsibility for Learning. This replaces the concept of student effort within our reporting system. For the evolving educational initiatives at Oakley College, Responsibility for Learning provides for students and parents more direction and information in seeking improvements in learning outcomes. 1. Problem-solving: Finding a way to understand or solve things on which students are stuck. 2. Independence: Developing the ability to find answers, check answers and to learn independently. 3. Responsibility: Taking ownership of learning; motivation; gauging progress; not making excuses, but instead finding ways to improve. 4. Resilience: This relates to determination, and not giving up when things get hard. It leads to the important concept that students are only really learning something new when they have to go and find it out, or really have to work at it. 5. Challenge: This must be an element within all learning if students are to make most progress. Students should take on challenges with enthusiasm, accept possible failure and the need to review their failure to improve next time. 6. Resourcefulness: Students should make sure they are using all the strategies available to solve problems, making good use of sources of information, expertise and knowledge. Students are recommended to use the following learning strategies when they are finding difficulty with their work. This will help them solve problems independently. We encourage parents to reference these when students are completing homework. • Using class notes or textbook to look for explanations. • Check subject blogs on the school website. • Use revision websites and subject websites for curriculum (there are lots of them). • Watch explanations on Youtube (and try more than just one, to find which is best). • Writing a note at the end of homework to communicate to teachers what anything on which students got stuck, and what strategies they tried to use to fix their understanding. This allows teachers to help students with their skills and strategy development. • Students can explain their understanding of an idea to someone older, using English, to see what they think of the explanation and the clarity of the words used. • Students can explain their understanding of an idea to someone younger, or in their class, who doesn’t already know the ideas, to see if they can understand the concepts from the explanation. • Students can sketch diagrams or a mind-map to structure their ideas and thinking.